I must speak to you about my favorite scrub the time, signed La Sultana de Saba. The beauty brand in Eastern known for its rassoul or black soaps, invites us on a journey with a new line called “travel on the road in Malaysia”, consisting of a body oil, milk, of shea butter and wax body exfoliation absolutely divine. Product Focus! Pot authentic and refined: We will not sulk our pleasure, as always with La Sultana de Saba, special attention is paid to the packaging. 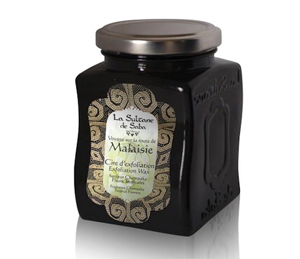 Printed in a cardboard box hides an elegant glass jar dark wavy molded the brand name. Very pretty to look at the edge of the bathtub, and we will not hesitate to reuse when empty. Composition: Wax exfoliation – green, see picture – consists of organic cane sugar, powdered shell and coconut shell to remove dead skin cells and impurities, shea butter and Coconut oil nourishing leave a protective film on the skin and flower Champaka (a tropical flower widely used by Malaysian) for perfume. Use: Apply to wet skin and massage in circular movements, taking care to emphasize the rough parts (elbows, knees, heels) then rinse. Effects: The wax has a creamy texture that exfoliates the skin perfectly without attacking. A real treat to use, the skin becomes smooth and very soft.